STINAPA employee discovers lifeless body of newborn baby whale on the beach of Boka Chikitu in Washington-Slagbaai National Park. The government’s Marine Mammal Incident team was notified, so action could be taken to collect necessary information. During a tour of the Washington-Slagbaai National Park a STINAPA employee discovered the lifeless body of a newborn baby whale on the beach of Boka Chikitu. This baby whale belongs to a species of whale called Pygmy Sperm Whale (Koga breviceps).We know almost nothing about this type of whale as they are almost never encountered at sea. Most of the information collected and shared about this species is from animals washed up on the beach. This type of whale is not much bigger than a dolphin. They can reach a length of 3.5 meters and can weigh up to 400 kg. A newborn baby has a length of approximately 1.2 meters. The Pygmy Sperm Whale is found in tropical and temperate zones of the Atlantic, Pacific and Indian Oceans. 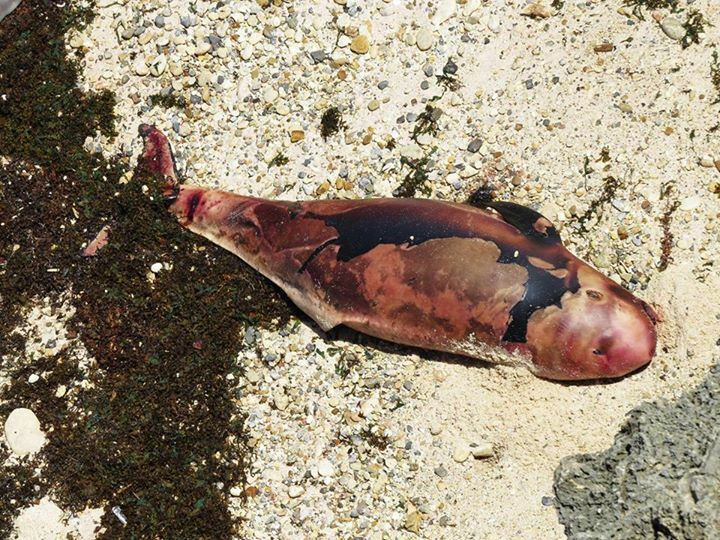 Examinations of the stomach contents of washed up pygmy sperm whales suggest that this species eats mostly squid. The government team responsible for investigating incidents involving stranded marine mammals collected data from the body.